Ahh, these words bring the feeling of comfort! Are you someone that suffers from digestive issues? Have you ever had a "gut wrenching" experience? You are certainly not alone! And the good news is, there are resolutions to improve these uncomfortable symptoms. Did you know that the gastrointestinal tract (gut) is 25-30 ft. long. It serves as the gateway of nourishment for every cell in the body, as well as the primary waste removal route? So you can see why keeping this sophisticated system clean and balanced is so important for good health and vitality. Your gut holds the key to your good health! The intestinal tract is an outside tube, inside the body. Think of it, from end to end, it is open to the outside world. The gut barrier is the gatekeeper that decides what gets in, and what stays out. Thank goodness 70% of our entire immune system is located in the lining of the gut. It works hard to protect us from harmful toxins, bacteria, and foreign invaders. Having a healthy balance of beneficial bacteria, in the trillions of tiny critters that we have in our gut, helps to keep our immune system calm and working seamlessly. 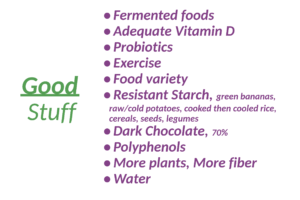 The Health of Your Digestive System recently? 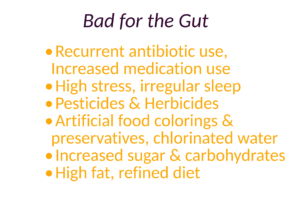 There are many factors that influence your digestion: stress, eating high amounts of sugar and carbohydrates, recurrent antibiotic use, multiple medications, chemotherapy, sleep habits, pesticides and herbicide use, metal toxicity, chlorinated water, and more. These all play a role in symptoms such as gas, bloating, weakened immunity, fatigue, autoimmunity, depression, food sensitivities and mental fogginess. 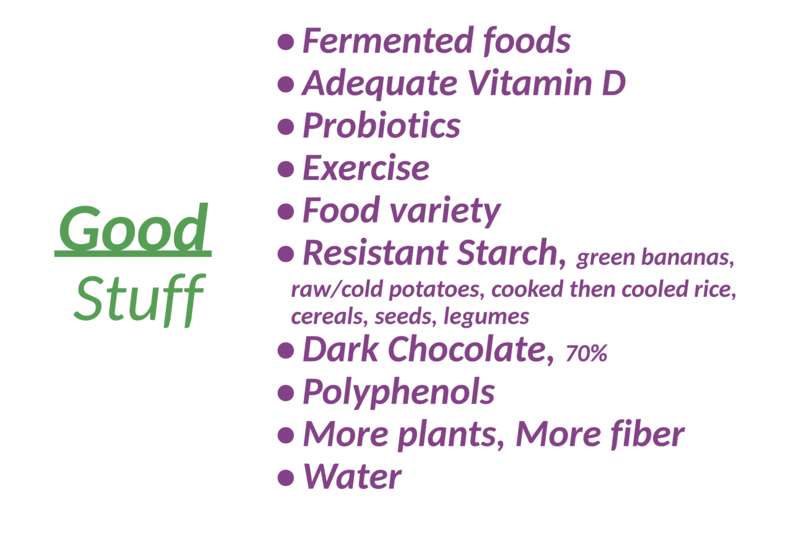 These are just a few of the aftereffects from an unbalanced gut. 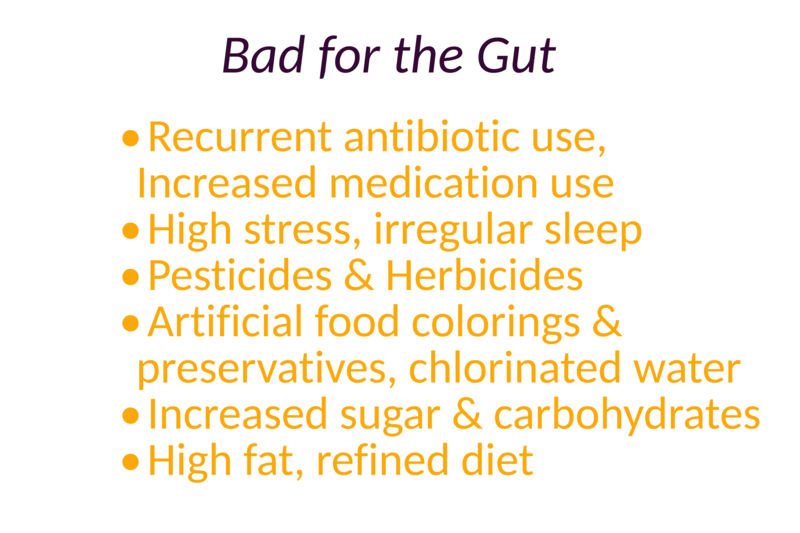 Yes, gut health influences every metabolic function in our body, and our very basic well-being. For many clients, once they had their gut health in balance, through dietary, lifestyle changes and targeted nutrition supplements, they realized what feeling truly "normal" was. The health of the gut even affects the health of the brain. There is a saying among functional practitioners, "if you gut is leaky, then your brain is leaky." A leaky brain is when that protective blood brain barrier, (BBB), has become breached and substances normally kept out of the brain, are able to cross over through the walls of the vessels into the brain. The gut and the brain talk to each other through chemicals called neurotransmitters. The conversation between the the 2 happen via Gut - Brain Axis. This is a two way communication. The brain affecting stomach acid, motility, transit time and more. While a gut with Candida can intoxicate the brain, imbalanced bacteria can cause decreased nerve conduction, gluten and casein (milk protein) proteins act like opiates, and pathogenic bacteria can produce neurotoxins. Gut Health & Brain Health go hand in hand. Are you searching for normal? What's your default when your digestive issues start to rumble? Do you typically do what you always do; deal with it and wait until it gets really bad? This is an opportunity to change that pattern and "take care of yourself." If you are ready for revitalization of your health, and living life on your terms, give us a call at 877-428-0555, or send us an email. Either way, we will get back to you.